Delta 0-1 Hz: neocortical, and thalamo-cortical networks. Large-scale cortical integration. Theta: subcortical and thalamo-cortical source, involved in a variety of cognitive functions (Hipo theta). Alpha 8 - 13 Hz: amplitude is related to the level of cortical activation, strong alpha associated with coritcal & behavioural deactivation or inhibition; otherwise (1) highly specific perceptual, attentional, and memory processes. cortically generated (Gross 2004 reported a large scale beta too), b/c of local strictness. 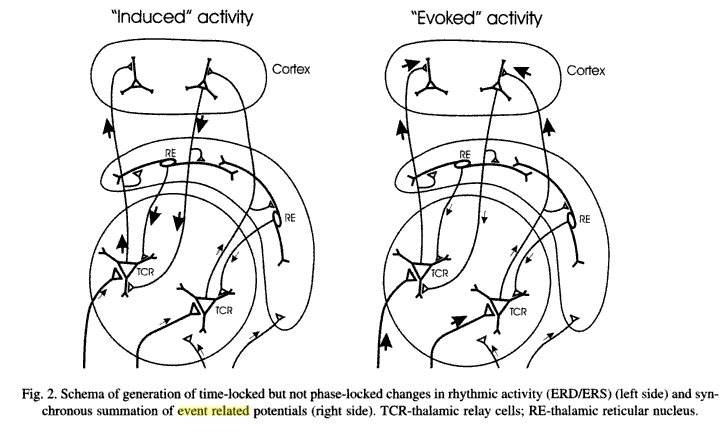 Mainly associated with motor, ERD before/during movement, rebound after the movement stopped. Attention and higher cognitive functions. * more recent --> human gamma frequency were reported for encoding, retention and retrieval of info independent of sensory modality. Problem: small amplitude, similarity to muscle activity leaks into the sensors. pp 5, widespread coherence in gamma& alpha bands in conscious perception vs unpercepted stim (Rodriguez et al., 1999; Klopp et al., 2000; Mima et al., 2001). pp 7, (Sauseng et al., 2007a) midline theta, increased with task-demand (power diff independent of novelty), in line with literature on sustained attention, localized into ACC, cingulate motor area. But long range fronto-parietal theta phase coherence was stronger in the novel condition. instantaneous phase of a slower oscillation modulates the amplitude of a higher freq (Lakatos et al., 2005). delta --> theta, theta --> gamma, hierarchical organization. in humans, theta --> gamma (Mormann et al., 2005; Demiralp et al., 2007a,b; Canolty et al., 2006). Basar, E., 1999a. Brain Function and Oscillations I: Principles and Approaches. Springer, Berlin. Basar, E., 1999b. Brain Functions and Oscillations, II: Integrative Brain Functions.Springer, Berlin. 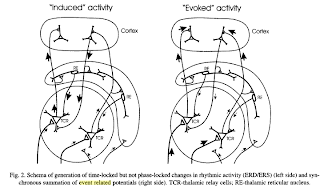 (1) Evoked response: time-locked & Phase-locked, which could be found from simple averaging. It's the response of a stationary system to the external stimulus. (2) Induced response: time-locked but NOT phase-locked, can only be extracted through non-linear methods (e.g. envelope detection or power spectral analysis). It could be understood as a change in the ongoing activity, resulting from the changes in the functional connectivity within the cortex.Various factors: may depend on modulating influence arising from neurochemical brain systems, on changes in the strength of synaptic interactions or on changes affecting the intrinsic membrane properties of local neurons. President of the International Society for Neurofeedback and Research (ISNR). *indicate sensory binding, perceptual binding (association) high gamma synchrony in meditation experts, and clairvoyant subjects. R. Davidson lab. Do you cite any of Collura's papers in your introduction? This is a very good intro to ERP and the meaning of different bands. I don't think I will cite any of his papers. But Pfurtscheller's 1994 1999 paper will be cited.